How do I draw a floorplan sketch? A laser measure – we like this one by Leica. Graph paper – this pad by Silvine is really good. (Other graph papers are available). A pencil with rubber – any will do, but these colourful Bic’s are great! How do I draw the floorplan? Before we dive it, you should know that everything written below is summarised in this wonderful infographic called How to draw a floorplan [Infographic]. It's yours to download for free! Stand outside at the front of the property. Start your sketch towards the bottom corner of the paper – but leave some space in case there are any unexpected extensions or parts of the property that stick out. The benefit of using graph paper to draw your own floor plan is that you can use each square as a unit of measurement. You could try walking the length of an external wall, counting your steps and then converting those steps to squares on the graph paper. This helps keep things roughly to scale. Or you could just do it by eye, depends on your skills. Do this for all the walls for all floors until you have a rough ‘footprint’ of the building. Personally, I like to use a different page of graph paper per floor but you don’t have to. Whilst still outside, draw on the windows and doors. This really helps to identify where internal walls are when you head inside. Just a simple line for a window, and an arc for a door. Don’t worry if these aren’t exactly in the right place, you’ll find out soon enough when you come to draw the internal walls. You may need to use that rubber soon. Head inside the front door and starting with the ground floor, head through doing your best to correctly sketch out the location of the walls. Whilst you’re at it, draw on any internal doors. I guess this is personal preference, but you can either leave measuring the rooms with your laser measure until you have sketched all the walls or measure as you go along. Start firing that laser. Place the bottom of your laser measure against a wall and aim it across to the other side of the room, make sure it is level and not angled up or down, then press the button to take the measurement. Write it clearly on the plan next to said wall. A simple square room will just need two measurements. For more complex room shapes, best to take a measurement of each section of wall. As a rule of thumb, the more measurements the better. A quick note on measurement units: We provide floor plans for real estate agents in both Metric and Imperial units, but you should be using meters and centimeters on your sketches. In the kitchen, draw a line or two to show the worktop location, and bang on roughly where the sink and hob is. Use your innate artistic abilities to do this in any illustrative style you like, but less is more here! When it comes to heading upstairs, draw a few lines to show the position of the stairs. Measure the width of the stairs and not this on the plan as well. In bathrooms and WC’s, sketch where any sinks, baths, showers and toilets are located. Other things to include in your sketch could be cupboards in bedrooms, Velux rooflights, understairs cupboards, or anything else really – draw it, we can include it. In your finest and most careful handwriting, make sure things are clearly identifiable. Firstly, make sure each floor is named e.g. Ground floor, First floor, Basement etc. Then, in the center of each room, write the name of that room. And with bedrooms, identify them by number e.g. Bedroom 1, Bedroom 2 and so on. If your floor plan is spread over a few pages, number them. Add any other notes you think will help us to correctly convert your sketch into a finished floorplan should be included as well. Want to show the orientation? South facing gardens are good, so show this with a North arrow. Use a compass or an app to find the orientation, draw the North arrow in a corner somewhere and we’ll include it on the plan. 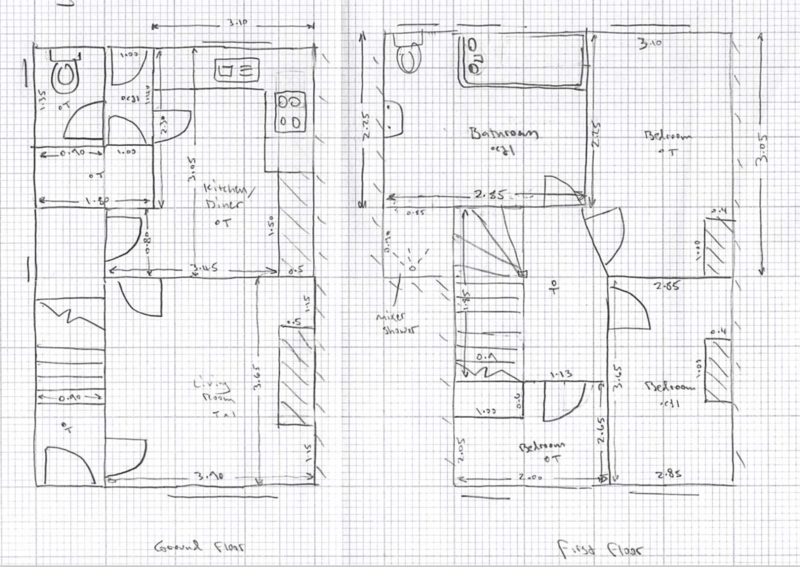 Once you’re happy with your sketch, send it to us for the Floorplan Sketch Conversion treatment. With a simple drag and drop you can leave it with us to create a beautiful and bespoke floorplan.